Nikolay Kanev, Associate Prof., Ph.D.
Stefan Yordanov, Associate Prof., Ph.D. I have just been invited by the international quarterly, Cultural Anthropology and Ethnosemiotics ISSN 2411-6459, to submit my first article. Since this is the second new journal to have invited me to submit, I will not be able to write my first article for them until the autumn of 2017. Thus my article will not appear in Cultural Anthropology and Ethnosemiotics until the summer of 2018. I am deeply honoured by this unsolicited invitation. This article will doubtless focus on my ongoing efforts to decipher Linear A, at least partially. Academia.edu DRAFT PAPER = Preview and brief summary of the article, “The Mycenaean Linear B ‘Rosetta Stone’ to Minoan Linear A Tablet HT 31 (Haghia Triada) Vessels and Pottery”, to be published in Archaeology and Science (Belgrade) ISSN 1452-7448. Vol. 12, 2018. Academia.edu DRAFT PAPER = Preview and brief summary of the article, “The Mycenaean Linear B ‘Rosetta Stone’ to Minoan Linear A Tablet HT 31 (Haghia Triada) Vessels and Pottery”, to be published in Archaeology and Science (Belgrade) ISSN 1452-7448. Vol. 12, 2018. (approximately 40 pages long), with some excerpts from the article to whet your appetite. This article represents the first major breakthrough in 117 years in the partial, though far from complete, decipherment of Minoan Linear A. Even this preview, with excerpts running to 9 pages from the actual article, will give you a quite clear idea of exactly how I managed to finesse the decipherment of 21 % (107/510 words) of Minoan Linear A lexicon, more or less accurately. Anyone the least bit interested in the ongoing struggle to decipher Minoan Linear A, even partially, is definitely going to want to read this preview and brief summary, with a few excerpts from the article, which is to appear sometime early in 2018. It quite literally represents by far the most significant development in any attempt to decipher even a relatively small subset of the Minoan Linear A lexicon. as has the article about to be published in Vol. 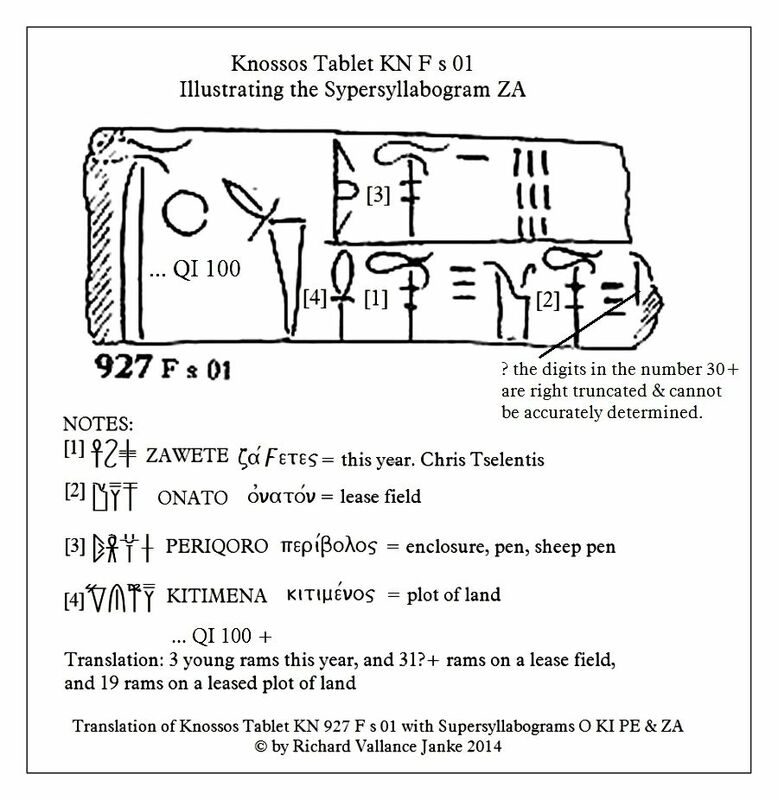 11 (2015),  “The Decipherment of Supersyllabograms in Linear B”, which runs from page 73-108, for a total of 35 pages. See previous post for details on that article. I have just received the DRAFT of the entire issue of Vol. 11 (2015) Archaeology and Science (Belgrade) ISSN 1452-7448, in which my ground-breaking article, “The Decipherment of Supersyllabograms in Linear B” appears on pp. 73-108 (35 pages long). I have proof-read it and I found errors only in the transcription of the SPIonic.ttf Greek font, which causes all the Greek text to be printed in Latin characters, such that they appear garbled. But this error will be eliminated in the actual article when it appears this coming winter (2017). 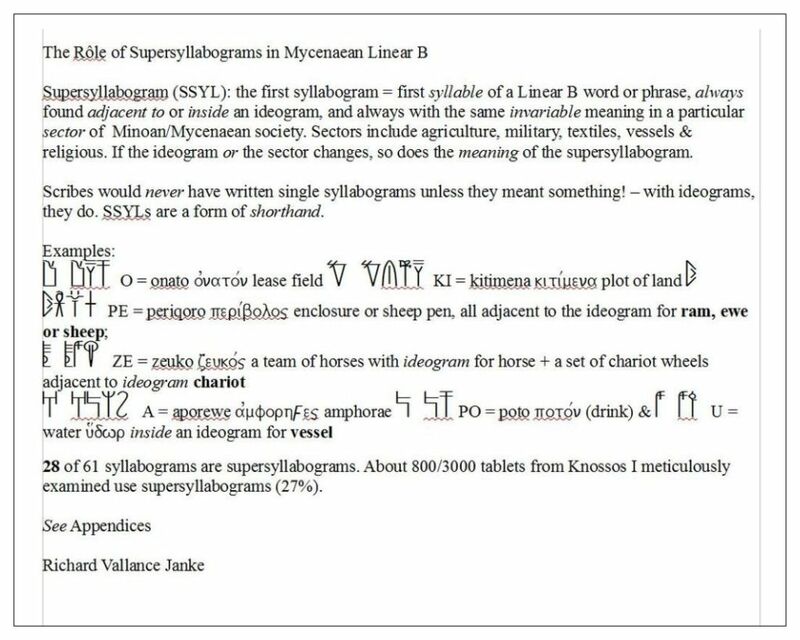 NOTE that the decipherment of the 36 supersyllabograms is the first and last major breakthrough in the final decipherment of Mycenaean Linear B, which was first deciphered by Michael Ventris in June-July 1952 (with the exception of supersyllabograms, which account for at least 20 % of the text on Linear B tablets). and I fully  expect that I shall completed the draft Master by no later than Oct. 15 2016, by which time I shall submit it to at least 5 proof-readers for final corrections, so that I can hopefully submit it to the journal by no later than Nov. 1 2016. This article is to prove to be a ground-breaker in the decipherment of at least 21.5 % = 116 terms of the extant vocabulary = 510 terms by my count, of  Minoan Linear A, although I cannot possibly claim to have deciphered the language itself. Nor would I, since such a claim is unrealistic at best, and preposterous at worst. Nevertheless, this article should prove to be the most significant breakthrough in any partially successful decipherment in Minoan Linear A since the first discovery of a meagre store of Linear A tablets by Sir Arthur Evans at Knossos 116 years ago. This Glossary contains only Minoan Linear A terms which have been deciphered either with certainty or with a reasonable degree of certainty. It is more or less the version which will be published in my article slated for publication in Vol. 12 (2016), “Pylos tablet Py TA 641-1952 (Ventris), the ‘Rosetta Stone’ to Minoan Linear A tablet HT 31 (Haghia Triada) vessels and pottery” of the prestigious international annual, Archaeology and Science ISSN 1452-7448 (release date spring 2018). To be submitted by Nov. 15, 2016.
adu = so much, so many, all (persons, things, esp. grain/wheat), referencing all  accounts relevant to them. In the case of grains & wheat, adu would refer to all the “ bushel-like” units of wheat accounted for. In the case of the men measuring the wheat, it would appear that they are surveyors or comptrollers. Cf. Linear B, toso, tosa. jedi = man/men = Linear B atoroqo. ASSC		Actes del XV Simposi de la Secció Catalana de la S.E.E.C. CAMB		Proceedings of the Cambridge Colloquium on Mycenaean Studies. Press, © 1966. First paperback edition, © 2011. vii, 309 pp. Linear B: Mycenaean Greek Texts and their World. Vol. I.
Louvain 120). Louvaine-la-Neuve, France: Peeters, © 2014. KTMA   	        KTEMA, civilisations de l’orient, de la Grèce et de Rome antique. tenu à Chaumont sur Neuchâtel du 7 au 13 septembre 1975, Neuchâtel. l’École française d’Athènes (sic) (Athènes, 2-6 octobre 1990). MYCAc 	        Carlier, P., de Lamberterie, C., et al. Etudes Mycéniennes 2010. 2.5 If the same author(s) or editor(s) is/are cited under a title different from the first one or in a previous identical title or reference not immediately preceding the current one , each entry subsequent to the first one is tagged, Ibid. = Latin adverb ibidem, approximately equivalent to the English “by the same author(s) or editor(s) ”. 2.6 Monographs and articles, for which I have been unable to find sufficient bibliographical date are tagged (PDF) and may be downloaded in PDF format. 2.7 If there are more than two (2) or (3) Author(s) or Editor(s) for any given entry, the first two are named, followed by the tag, et al. = et alii, Latin for “and others”. 2.8 If there is any error in any entry, orthographic or other, it is followed by the tag (sic) Latin for “thus”. 2. Aravantinos, V.L., Godart Louis & Sacconi, A. Thebes. Fouilles de la Cadmee I. Les tablettes en lineaire B de la Odos Pelopidou. Édition et commentaire. Pisa and Rome: Istituti editoriali e poligrafici internazionali, © 2005. xii, 339 pp. 18. Burke, B. 2010. From Minos to Midas: Ancient Cloth Production in the Aegean and in Anatolia. (Ancient Textiles Series, Vol. 7). Oxford: Oxbow Books. © 2010. 19. Carington-Smith, J. Weaving, Spinning and Textile Production in Greece: The Neolithic to Bronze Age. Australia: University of Tasmania. 20. Chadwick, John,  Killen, John T. & Olivier, Jean Paul. The Knossos Tablets. 28. Duhoux, Y. Aspects du vocabulaire économique mycénien (cadastre – artisanat – fiscalité). Amsterdam: A. M. Hakkert © 1976. 202 pp. 30. Duhoux, Y. “Mycenaean anthology”, pp. 243-393 in CMLB. Vol. I, no pagination. 37. Foxhall, L. “Cargoes of the Heart's Desire: The Character of Trade in the Archaic Mediterranean World”, pp. 295-309 in Fisher, N. & Van Wees, H. eds. Archaic Greece, New Approaches and New Evidence. Duckworth: The Classical Press of Wales. 48. Gulizio, Joann. Mycenaean Religion at Knossos. Austin: University of Texas at Austin. (Phd. Thesis), August, 2011. This dissertation addresses methodological issues in the archaeological and textual evidence for religion in Knossos (LM II-LM IIIB1). The economic focus of Linear B tablets means that there is limited information about religion. It is difficult to assess archaeological evidence for phases of cult practice at Knossos in light of the time line of palace administration. Thus archaeological and textual evidence appears in two temporal phases, allowing for a more accurate assessment of the evolution of religious beliefs and practices in the late Bronze Age culture of Knossos. While earlier Minoan shrines persist, they are incorporated into the pantheon of the new Indo-European deities at Knossos introduced by the newly-established Greek elite. Eventually, the epithets of several Minoan divinities often replace the Greek theonyms in ritual offerings, although Minoan shrines fade from use. Consequently, the nature of Mycenaean religious observances at Knossos represents a unique blend of both Minoan and Mycenaean religious beliefs and practices. 53. Jones, D.M. “Land tenure at Pakijane: some doubts and questions”. pp. 245-249 in CAMB. 56. Ibid. “Last year’s debts on the Pylos Ma tablets”, pp. 173-188 in SMEA. 58. Ibid. “The Linear B Tablets and Mycenaean Economy”, in Morpurgo, Davies A. & Duhoux Y., eds. Linear B: A 1984 Survey: Proceedings of the Mycenaean Colloquium of the VIIIth Congress of the International Federation of the Societies of Classical Studies (Dublin, , 27 August -1st September 1984). Louvain-La-Neuve: Peeters. 59. Ibid. “Mycenaean economy”, pp. 159-200 in CMLB. Vol. I. 64. Lane, Michael Franklin. 14. From DA-MO to DHMOS: Survival of a Mycenaean Land Allocation Tradition in the Classical Period? pp. 110-116 n.d. (undated). 65. Ibid. “Landholding at PA-KA-JA-NA: Toward Spatial Modeling of Mycenaean Agricultural Estates”, pp. 61-115 in PASR. Vol 6. 2012. 67. Lejeune, M. “Chars et Roues à Cnossos: Structure d 'un inventaire”, pp.287-330 in Ibid. Mémoires de philologie mycénienne, lll. Rome, 1972, in Minos. Part B, Citations 70-138 to follow in the next post. 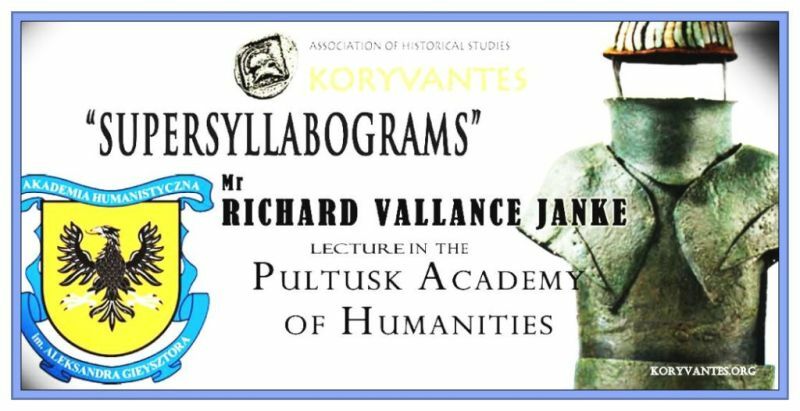 Richard Vallance Janke, the moderator of this blog, has been cordially invited to give a talk on The Rôle of Supersyllabograms in Mycenaean Linear B at the Conference “Thinking Symbols”, University of Warsaw, Pultulsk Academy of Humanities, June 30 – July 2, 2015. His talk will serve as the official public announcement of his discovery of some 30+ supersyllabograms in Mycenaean Linear B throughout 2014 and early 2015. This is the probably the most significant breakthrough in the decipherment of Mycenaean Linear B in 63 years since the genius, Michael Ventris, first deciphered the vast majority of the syllabary in 1952-1953. Although Michael Ventris and his mentor Prof. John Chadwick were able to decipher almost all of the syllabary, and there have been significant developments in further decipherment since then, one very large chunk of the syllabary (consisting of some 700/3,000 or 27 % of intact tablets from Knossos I meticulously examined in the course of 2014) have remained recalcitrant to decipherment for the past 63 years. From my intensive analysis of these 700 tablets, I have come to the conclusion that there has been no serious concerted effort in the past 63 years to thoroughly inspect the 3,000 or so tablets which I took the trouble to examine so closely. No doubt the task was not undertaken, since to do so would have required a team effort on the part of several specialists in Linear B linguistics. But I could not wait on the problem any longer. So I took it upon myself alone to meticulously examine that many tablets! And what an exhausting job it was! But the pay-off in the exciting discovery I made was more than well worth the effort, to say the very least. 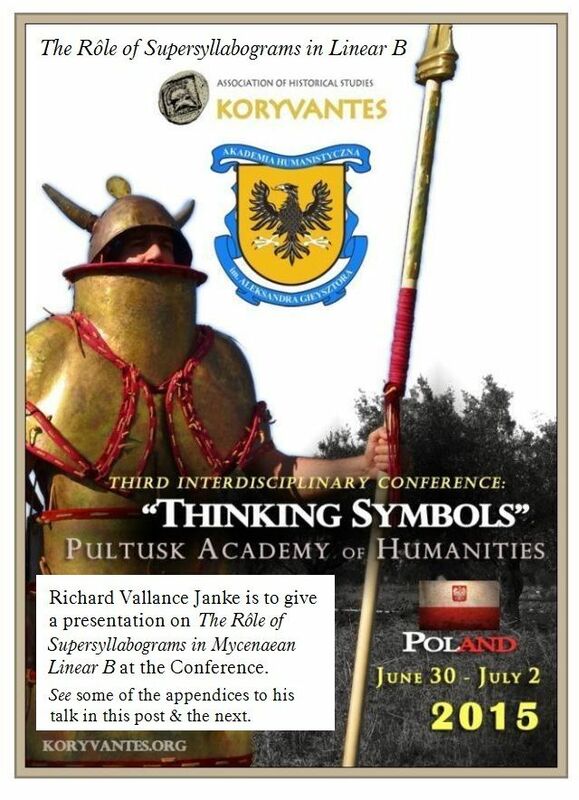 When the Association of Historical Studies, Koryvantes, in Athens, Greece, happened upon our blog late in 2014, they were immediately impressed by the extensive research I had carried out, and very soon asked me whether I would like to participate in the Conference “Thinking Symbols”, at the Pultulsk Academy of Humanities, University of Warsaw, between June 30 & July 2, 2015. Of course, I accepted. I shall be giving a 20 minute talk, more like a presentation, on the discovery of supersyllabograms in Mycenaean Linear B, and the significant rôle they play in the decipherment of at least 700 tablets which had previously proven recalcitrant. This talk is to serve as the premier public forum for the official international announcement of the rôle of supersyllabograms in Mycenaean Linear B. The University of Warsaw will consequently be publishing the presentation in its entirety, along with those of all the other speakers at the Conference. The University of Warsaw is in the ideal position to publish our book, The Decipherment of Supersyllabograms in Linear B, likely to run to 200 pp. or more, sometime late this year or early in 2016. This would be a huge feather in their cap, as the book itself represents the most significant breakthrough in the further decipherment of Linear B since 1952. Cambridge University Press had the honour of publishing the original book by Prof. John Chadwick, The Decipherment of Linear B (1958, 1970). So the University of Warsaw has much to celebrate in the publication of the second major book, The Decipherment of Supersyllabograms in Linear B, which takes the inspiration of its title directly from the title of the original.